In general, a fallacy is an error of reasoning, used, often intentionally, to win an argument. You’ll find that the pseudoscience pushing crowd love logical fallacies because, frankly, they are so easy to use. And they work so well, because it shifts the argument from evidence and facts to rhetoric and disinformation. Because the science denialist crowd, which include (but not limited to) creationists, homeopaths, anti-vaccinationists, global warming deniers, alternative medicine pushers, and sasquatch fans, have no evidence supporting their positions, they have tended to use logical fallacies to argue against the skeptical side. 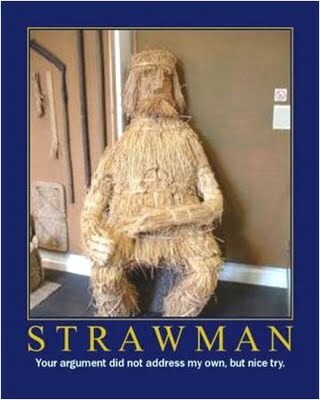 The Strawman Fallacy is admittedly my favorite, because it takes such creativity to invent it, and the fallacious arguer will use it until their last breath. Basically, a strawman fallacy is an attempt by an arguer to invent a position for the other side, then dismiss the other side because of the invented position. For example, the anti-vaccination crowd will say “you don’t care about our autistic children,” then in the next breath, state that because we don’t care about their autistic children, vaccines are bad. It’s called a strawman because you look at that argument (we don’t care about autistic children) rather than the evidence that vaccines do not cause autism. It’s frustrating beyond belief. One of my favorite bloggers, Rosa Rubicondior, just posted Favourite Fallacies – The Straw Man, an amusing deconstruction of the creationist strawman arguments. Read it if you have a chance.